We already briefly touched the conditions’ topic while discussing the CPSR register. We use conditions for controlling the program’s flow during it’s runtime usually by making jumps (branches) or executing some instruction only when a condition is met. The condition is described as the state of a specific bit in the CPSR register. Those bits change from time to time based on the outcome of some instructions. For example, when we compare two numbers and they turn out to be equal, we trigger the Zero bit (Z = 1), because under the hood the following happens: a – b = 0. In this case we have EQual condition. If the first number was bigger, we would have a Greater Than condition and in the opposite case – Lower Than. 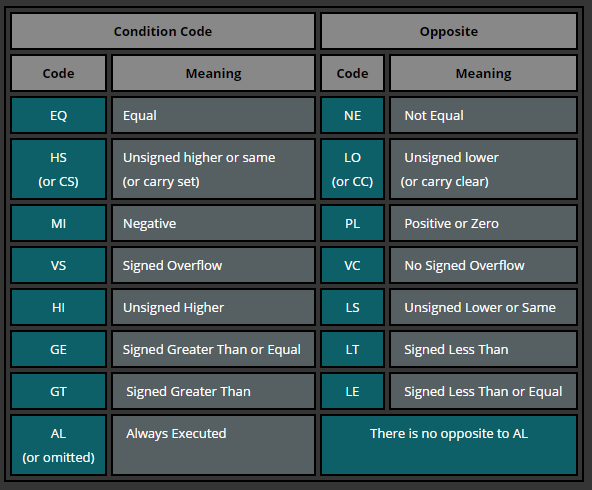 There are more conditions, like Lower or Equal (LE), Greater or Equal (GE) and so on. 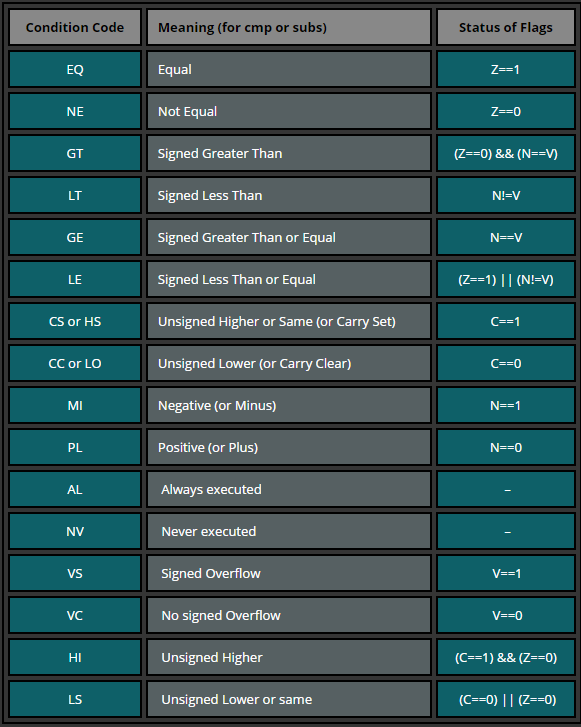 The following table lists the available condition codes, their meanings, and the status of the flags that are tested. We can use the following piece of code to look into a practical use case of conditions where we perform conditional addition. The first CMP instruction in the code above triggers Negative bit to be set (2 – 3 = -1) indicating that the value in r0 is Lower Than number 3. Subsequently, the ADDLT instruction is executed because LT condition is full filled when V != N (values of overflow and negative bits in the CPSR are different). Before we execute second CMP, our r0 = 3. That’s why second CMP clears out Negative bit (because 3 – 3 = 0, no need to set the negative flag) and sets the Zero flag (Z = 1). Now we have V = 0 and N = 0 which results in LT condition to fail. As a result, the second ADDLT is not executed and r0 remains unmodified. The program exits with the result 3. In the Instruction Set chapter we talked about the fact that there are different Thumb versions. Specifically, the Thumb version which allows conditional execution (Thumb-2). Some ARM processor versions support the “IT” instruction that allows up to 4 instructions to be executed conditionally in Thumb state. ADD    R0, R0, R1   ; Syntax error: no condition code used in IT block. 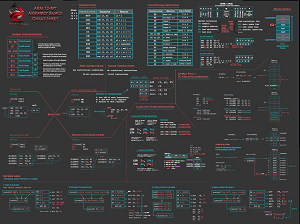 .syntax unified    @ this is important! This example code starts in ARM state. The first instruction adds the address specified in PC plus 1 to R3 and then branches to the address in R3. This will cause a switch to Thumb state, because the LSB (least significant bit) is 1 and therefore not 4 byte aligned. It’s important to use bx (branch + exchange) for this purpose. After the branch the T (Thumb) flag is set and we are in Thumb state. In Thumb state we first compare R0 with #10, which will set the Negative flag (0 – 10 = – 10). Then we use an If-Then-Else block. This block will skip the ADDEQ instruction because the Z (Zero) flag is not set and will execute the ADDNE instruction because the result was NE (not equal) to 10. Stepping through this code in GDB will mess up the result, because you would execute both instructions in the ITE block. However running the code in GDB without setting a breakpoint and stepping through each instruction will yield to the correct result setting R1 = 3. Branches (aka Jumps) allow us to jump to another code segment. This is useful when we need to skip (or repeat) blocks of codes or jump to a specific function. Best examples of such a use case are IFs and Loops. So let’s look into the IF case first. Now here is how we can use conditional and unconditional branches to create a loop. 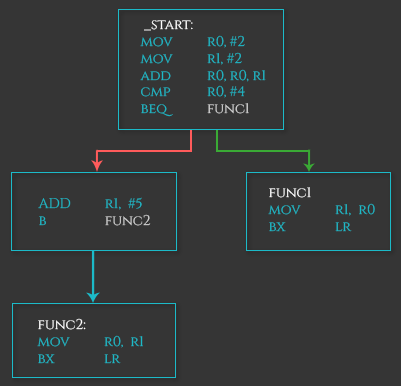 BX/BLX is used to exchange the instruction set from ARM to Thumb. Please note that the GIF above was created using the older version of GEF so it’s very likely that you see a slightly different UI and different offsets. Nevertheless, the logic is the same. Branches can also be executed conditionally and used for branching to a function if a specific condition is met. Let’s look at a very simple example of a conditional branch suing BEQ. This piece of assembly does nothing interesting other than moving values into registers and branching to another function if a register is equal to a specified value.